Science fiction and fantasy are not my favorite genres when it comes to books or movies. But there is one special memory I have regarding Stars Wars. 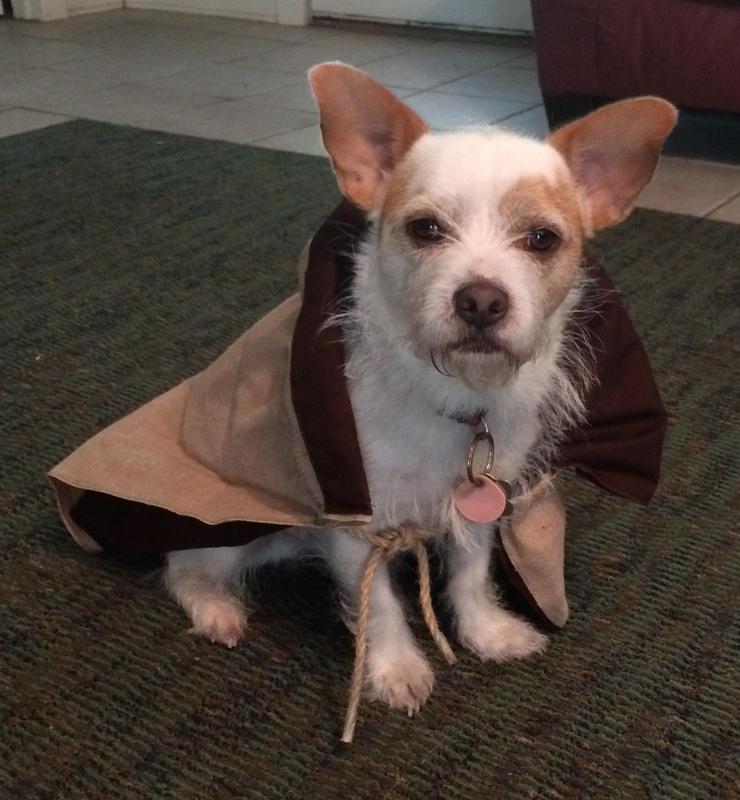 Our dog Jackson dressed up as Yoda. My children made him this cloak to wear. At one point, it even had a light saber to go along with it, but that has unfortunately been misplaced. Jackson loves his Star Wars costume about as much as I love the Star Wars movies. Okay, so it might have been a long time ago, but it wasn’t in a galaxy far, far way. It was in the tiny public library in the rural north Louisiana town where I spent my childhood. One of the things I looked forward to every year during summer break was the Library’s Summer Reading Program. Every Wednesday during the months of June and July, my mom would drive my brother and sister and I to the library, where we would spend an hour or so listening to stories, making crafts and checking out books to read for the next week. It all culminated in a final big activity on the last week, where prizes were given to the kids who read the most books. Most years, the big event was just a special story time with a cookies or cake at the end. However, the summer before my tenth birthday, the librarians promised an extra-special treat to anyone who read more than twenty books during the summer months. All June and July I looked forward to this secret prize, reading voraciously to ensure that I was able to participate in this mystery event. Finally, the big event arrived and the library was packed with kids who had diligently read all summer long. Soon, the librarian gathered all the kids around, giving a short speech to us before allowing us to go inside the meeting room for our special treat. The group made a collective gasp. I entered the room, almost reverently, noticing the big reel-to-reel projector already set up at the back. A projection screen on a tripod stand stood somewhat precariously at the front. I found a seat toward the back of the room and eagerly waited to find out what exciting movies we might get to see. I anticipated the movie we were about to see would be something Disney. Perhaps it would be the Apple Dumpling Gang, starring Tim Conway. But it might not be Disney. In that case, maybe it would be Popeye, starring Robin Williams. I had seen both of those movies the previous summer while visiting with my grandmother in Texas. Her church had shown several movies suitable for families and those were among the ones I had seen. Mostly, as I sat there waiting and wondering, I hoped it wasn’t going to be a cartoon. Soon, the room was filled to capacity with excited kids, everyone talking in hushed whispers. It felt absolutely thrilling to be in this room! A small group of librarians bustled around the projector. Finally, after a short eternity, one of the ladies walked to the front. The room went wild with applause. Boys were high-riving and girls were squealing. Everyone, it seemed, was elated. Everyone, that is, except for me. I sat there on the back wall, feeling dejected, wondering why the librarians had chosen Star Wars of all things. “For crying out loud, an old Herbie movie would have been better than this!” I thought. For the next 2+ hours, I sat in the dark room, listening to the clicking and clacking of the moving reels, bored to tears. To this day, I can’t tell you much of anything about Star Wars, except that then ( as well as now) I thought Princess Lea had perhaps the most ridiculous hairstyle ever invented. Watching Star Wars: The Empire Strikes Back via a reel-to-reel projection may not be much of a memory … but perhaps what makes it stand out most in my mind were the feelings I had of excitement leading up to the even followed by the utter dismay when I learned what my prize actually was going to be. But looking back, I realized I learned a great lesson that day about the importance of keeping my hopes high while not having over-blown expectations. It’s a fine balance to keep, but one that helps me not become overly emotional when life hands me lemons. After all, no matter my emotional state, God is there to give me comfort, hope and joy that cannot be taken away … even in the midst of disappointment. Additionally, even though I didn’t realize it until much later, this would be the last time I ever watched a reel-to-reel movie. Within a few short months, my family owned a VCR and a video rental store opened. We could watch movies (old or new) almost any time we wanted. Looking back, those were years which saw new technology advancing forward at a quick pace, taking American society into a completely new era in entertainment. My children cannot begin to relate to the changes I’ve seen in my 42 years of life regarding all forms of entertainment … which somehow reminds me of when I used to talk with my great-grandmother. Born in rural Louisiana in February of 1903, exactly ten months to the day before the first airplane flight, my great-grandmother never saw a car until she was nearly 13 years old. Yet long before her death at the age of 91, she lived in a world of space ships and world-wide travel. So well-done. This is what I think about a lot as I tell my kids that I went to school when there were no computers, no cell phones etc. They can’t imagine a life without technology. Makes me kind of sad too. Imagine going from no cars to space ships! Unreal how fast change comes about. Really enjoyed this post 🙂 PS I would have been upset about the Star Wars movie too. So interesting what we remember years later. Great job on this post, and this is a wonderful way to look at disappointing circumstances. This was SO not my experience with these movies…my brother and I thought this was the coolest movie we had ever seen! Thanks for jumping into the contest (even if it brought back sour memories) … tomorrow we’ll announce who gets the prize! I think it would be hilarious if you and Jackson won it! Congratulations to Lori … and thanks, John Mark, for including me with an honorable mention. I enjoyed writing about Star Wars, much more than I ever enjoyed watching the movies. Excellent Give-Away!